Well today's release did not go as smoothly as hoped. We discovered code that needed to be removed before going live, and found that not all of our versions matched what was on live. We did catch some (our version still had Untouchable at 2/5) but not all of them (Where did the Tribes 2 cards go?). We've learned a lot and will strive to make the next release much smoother. 1) Crutomist's Entangle is back to the way it was. We were testing adding Immolate to the ability based on community feedback, but forgot to pull it out when we decided to hold Cruto's update back for another release. 2) Akatril's Seraph Embrace is now described properly on her hero page. This ability only targets Light Alliance creatures (Holy, Mystical or Ancient). 3) All of the login issues should now be resolved. As for the Tribes 2 cards not appearing in the store. This will be fixed in the next update. The cards can still be played with and seen in your collection, they just aren't appearing in singles. Note this doesn't affect your ability to trade your Manacycle Wizards. Just send us an email at kingdomsccgsupport@ganz.com and we will make the exchange for you. And finally, Bahamut's change was not intended as a Buff or review of the hero. It was just a good requested change that was easy to implement and perfect for his flavour. It has been a long time coming, but we're proud to have released our first content update. 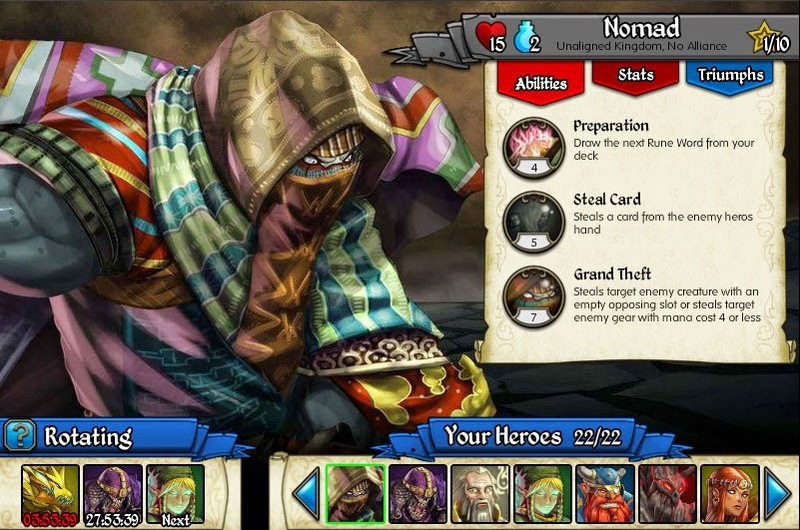 Our goal with this release was to shake up the metagame by rebalancing some heroes and cards, and releasing the first new hero in ages - Nomad. A full list of changes in below. We now move on to focusing on our first card set. Look for an official announcement soon! AI Fixes: Can be seen in AI Arena play and during Guild Wars. a. AI: Reconstruct will now target your own discard pile. b. AI: Demonic Thoughts will now be used on your own hero. c. AI: Golemnify will target opponent's creatures. d. AI: Nethergods Will will target opponent's creatures. e. AI: Frantic Search will target your own hero. Dravkas revision: Tinker moved from 3 to 5 charges. Augment moved from 5 to 4 charges. Manufacture (7 charge) has not been changed. Akatril’s Divine Summoning (Charges 6) will now clear all corpses and creates an Angel token. That token now has a cost of 4. New ability with new ability art. Alisten’s 3 charge ability is now Imposing Visage – Creature gains Timid. New ability, with new ability art. Alisten’s Summon Whelp moved from 5 charges to 4. 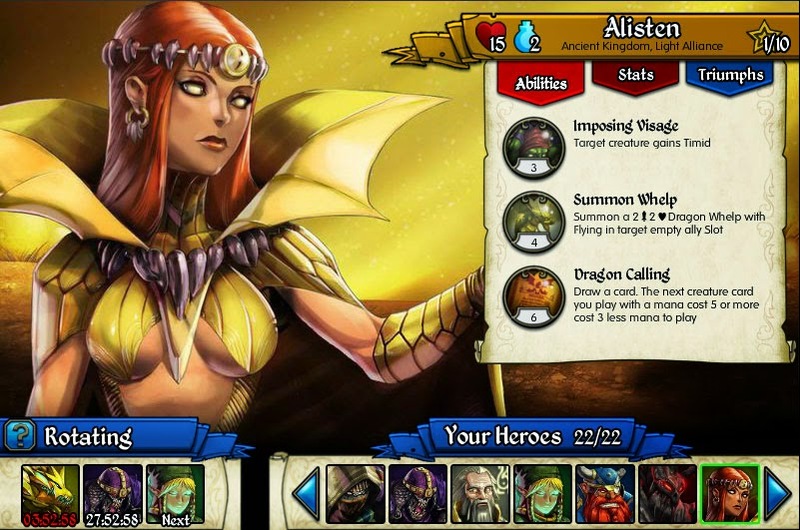 Alisten’s Dragon Calling moved from 4 to 6, now says “Draw a card. The next creature card you play with a cost of 5+ costs 3 less mana. 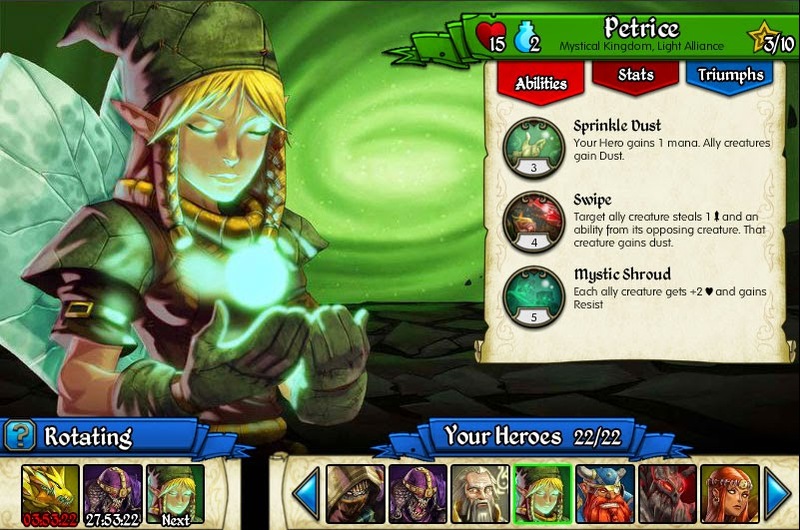 Petrice’s Sprinkle Dust now reads “Gain 1 mana. Ally creatures gain Dust.” – It is no longer targeted. Petrice’s Mystic Shroud (5 charges) now gives 2 Health, not 1. Bahamut’s ability Dragon Form (7 charge) now makes the creature it targets a Dragon in addition to its other subtypes. Nomad has been made active. Nomad is selling in the store for 90,000 gold or 69 Gems. Nomad’s 10 achievements have been added. The card “Manacycle Wizard” (Tribes Two Epic) now reads “On Death: Gain 2 Mana.” No longer has Allegiant, Manacycle reduced to 3. Spirit Sceptor has been renamed Spirit Scepter. Now has a cost of 3, was 2. The Kingdom-specific card packs now include cards from Rise. 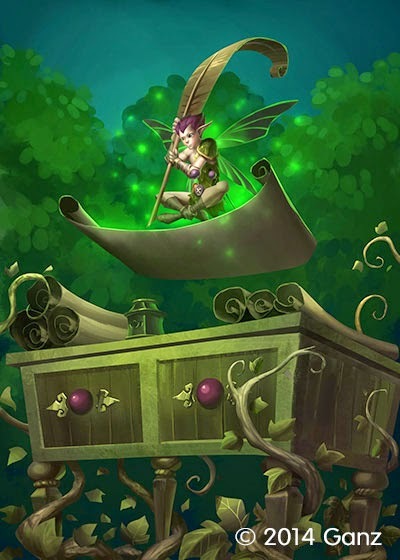 NOTE: In regards to the change in the card Manacycle Wizard: while we still see this card as one of the most powerful in the game - a Dirty Fuel on legs with no drawback - we recognize that it is no longer as powerful as it was. Therefore, we will be giving all players the option to trade in their Manacycle Wizards for any other Tribes Two Epic card. If you would like to do so, please send a message to kingdomsccgsupport@ganz.com and indicate the Epic that you wish to receive in return. Please note, that this is a one time exchange only, we will not reverse the exchange under any circumstance. KNOWN ISSUE: Not all of the new content has been translated into all supported languages. If you do not play in English, you will see some English in your game. We have decided to hold off releasing the game changes until Monday (Nov. 24). It took us longer to get through testing the changes than we had expected, and we don't want to release late on a Friday and risk having an issue over the weekend. A note to our Guild players. We'll be updating the servers around 9 am EST on Monday. After this time, the abilities of a number of Heroes and cards will have changed. We recommend that you log in as soon as you can to ensure that you're still happy with your Guild Defence deck. We will be releasing a full list of the changes along with the release. And to get your deckbuilding juices flowing over the weekend, we're happy to present to you the new Petrice, Alisten and for the first time... NOMAD. Back with another update! We're closing in on the release of our first update. We're aiming for the week of November 17th, and will post another update next week to tell you how we're doing. We're also proud to announce that we've begun the artwork for our next set. I've got our first sketch to show you below, and will be showing more sketches as they come in. To keep you talking over the weekend, we're ready to reveal the first of our Buffed Heroes. Yes, buffed! Justice Strike (4 charges): Deals 2 piercing damage to target creature. If that creature is 'Token', deals 5 instead. Seraph Embrace (5 charges): Target Light Alliance creature gains +1/+1, Flying and Blessed. Divine Summoning (6 charges): Remove all corpses.Then summon a 3/3 Angel token with Flying and a mana cost of 4 into an empty Ally slot. Akatril keeps her powerful removal on 4, gains a much stronger 5, and her 6 will now always get an Angel... and that Angel won't easily be dispatched. The Holy Kingdom will shine even brighter come our first release! 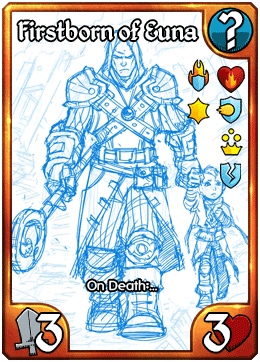 And in keeping with the reveals, here is how our promo Legendary is shaping up... with a first look at the art in progress!